When I was there I ordered pasta carbonara – a dish I really like and made quite often myself. Looking at the Vapinao cook preparing my food, I really questioned why I was standing in line for a dish that’s so incredibly easy to make. That’s when I decided to write this recipe. 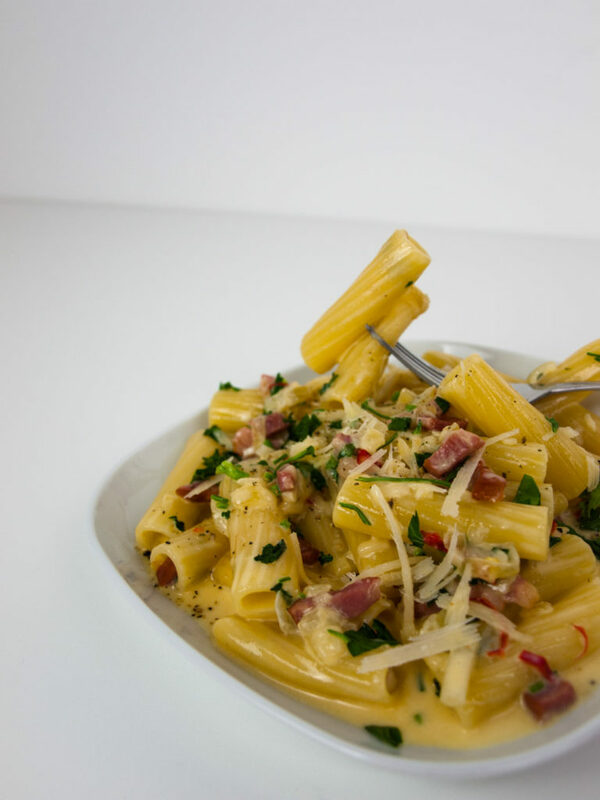 Pasta carbonara is so delicious and easy to make. It doesn’t break the bank and can be plated up in 15 minutes. Creamy yummy feel-good-food! So why ever stand in line for it again – make your own! Create a creamy delight fit for an Italian king! Boil the pasta in salted water according to the instructions on the package. Finely dice the onion and the garlic. Grate the parmesan cheese. Finely slice the red pepper. Chop the parsley. Put a skillet with high rim on medium heat. Add the olive oil to the pan and fry the bacon together with the onion for 3 minutes. Add the diced garlic and fry for another 2 minutes, stirring occasionally. Turn off the heat and pour the double cream into the skillet. Crack the eggs in a bowl and give a good whisk with a fork. Season generously with salt and black pepper. Pour the whisked eggs and the grated parmesan cheese into the skillet. Stir until everything is combined. Once the pasta has finished cooking, drain it and immediately add it into the skillet. The warmth of the pasta will cook the eggs and melt the cheese. Stir until the pasta is covered with the silky sauce. Sprinkle over the chopped parsley and sliced red pepper. Season with another dash of black pepper and stir once more. Garnish your pasta with another sprinkle of parsley, a good dose of extra grated parmesan cheese and serve immediately! Let me know what you think about the recipe in the comments below! Think the garlic is too overwhelming? Don’t like the heat of the red pepper in this pasta dish? I want to know it all – so let’s make this even better together! Previous Post The perfect Mojito!